Maybe Roy Hibbert, who is an All-Star, and David West? Really don’t score that much. Same with Tim Duncan and Tiago Splitter. Andre Drummond and Greg Monroe? Too young. Kevin Love and Nikola Pekovic? Maybe too ineffective. Dwight Howard and someone? But who? Blake Griffin and DeAndre Jordan. Got to make more free throws. With Joakim Noah, who had his fourth career triple-double Tuesday in the Bulls’ 100-85 win over the Atlanta Hawks, and with Taj Gibson adding a team-high 24 points to go along with 12 rebounds, Chicago just may have the best center/power forward combination in the NBA. Things may be looking a bit brighter. “Taj has given us balance,” Bulls coach Tom Thibodeau said about the emerging power forward who started again for the injured Carlos Boozer. “He’s a guy you can throw the ball into so you are not staying strictly on the perimeter. Taj has been very, very good. He’s got a good mix with his post game, duck ins, offensive rebounding, the face up, the pick and roll. He is scoring a lot of different ways. Like Simon and Garfunkel, they’re making sweet music on the basketball court. Like Ben and Jerry, they’re out there chillin’ and willin’. Like Jake and Elwood, they’re on a mission. And like Tom and Huck, there’s a little bit of mischief in each. “Just having fun,” said Gibson. And it’s the Bulls who are smiling as the team moved above .500 at 26-25 for the first time since Nov. 22, the game in which Derrick Rose was injured and lost for the season. Thibodeau confirmed Tuesday Rose would not practice with the team the rest of the season, assuring he won’t return until next season. But these Bulls do not appear finished as they moved past the Hawks into fourth in the Eastern Conference, a game behind third place Toronto. It’s been a long climb for the Bulls, who looked like a desperate and lost team with the season ending injury to Rose and then the trade of Luol Deng, at one point falling seven games below .500 and looking like they’d miss the playoffs. But the Bulls, who just closed a respectable 3-3 Western Conference road trip, have won 17 of their last 26 and are seeing some of their best play of the season from Noah and Gibson. Noah joined just Michael Jordan, Scottie Pippen, Tom Boerwinkle and Mickey Johnson in franchise history with at least four triple doubles as he had 19 points, 16 rebounds, 11 assists, equaling his career high (assists) he established just last week in Golden State. He also had three blocks. He is tied for third overall in the NBA the last three years in triple doubles behind only Rajon Rondo and Kevin Durant. He’s the Oscar Robertson of centers. And then there’s Gibson, who has stepped in with Boozer nursing a calf injury and simply owned the position. His post play got the Bulls off to another strong start, which in a lot of ways is the key to their success. The Bulls took a first quarter 33-17 lead. When they win the first quarter this season, they are 21-5 overall and 14-0 at home. Being a defensive oriented team, they are not built for big comebacks. Fast starts are essential, and Gibson has been able to help provide that with a post presence that has blossomed this season. “When I start, my mindset is to start the game off the right way, try to help us get the lead and get a nice rhythm going and try to (maintain) the lead,” said Gibson. Gibson’s done that, averaging 12.6 points and 6.5 rebounds this season and 19.3 points and 9.8 rebounds in his eight starts. Dec. 7, Pistons, 21 points and 10 rebounds. Of course, it will become that elephant in the room, about whether Gibson needs to become the starter. Thibodeau would never let a player lose a starting job because of injury. 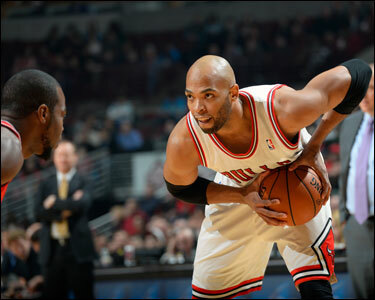 Boozer could miss one more game considering the All-Star break comes up after Thursday’s TNT game against the Nets. Boozer has said he wants to make sure he’s fully healed so he doesn’t have a recurrence. It thus makes sense he’d sit out another game. He remains listed day to day and game time decision. But it’s been big playing time for Gibson these last three starts. Gibson is averaging 22.7 points, 10.3 rebounds and four assists the last three games. He even made the big plays Tuesday down the stretch with a third straight game with at least 45 minutes played. The Bulls had taken a 25-point first half lead and still were leading by 20 late in the third quarter when they had their inevitable offensive breakdown. The Hawks led by Paul Millsap with 15 and Lou Williams off the bench with 13 had an 11-2 run to cut the Bulls lead to 80-70 after three. They were hanging in trailing 87-79 with under seven minutes left when Gibson broke a three and a half minute Bulls drought with a tough 16 footer with the shot clock about to run out. Then after a Mike Dunleavy jumper, Gibson displayed that post aplomb with a spinning move for a layup and 93-79 Bulls lead with 5:47 left that ended the home anxiety. But given this is the first time in Gibson’s career he’s become a true offensive threat, it also should motivate Boozer to fight for his position, which he’s never really had to do with no other scoring power forward. In theory, it should benefit the Bulls. It’s the Bulls who are smiling as the team moved above .500 at 26-25 for the first time since Nov. 22, the game in which Derrick Rose was injured and lost for the season. It’s sort of a motto for the insouciant Noah, who over these last three games with Gibson is averaging 15.3 points, 13 rebounds and 8.3 assists, arguably becoming one of the more versatile players in the NBA. He again showed off a variety of plays from his how’d-he-do-that jump shot, with which he’s no longer hesitating, to a strong presence at the rim with a couple of driving dunks to some of the most inexplicable shots and hustle plays that routinely frustrate the opposition. “A lot of players (when they) guard me, they back up a lot,” said Noah, who is changing that scouting report of giving him the shot. “They give me a lot of space because I can drive. That just opens up the dribble handoff game. I’m been just trying to concentrate on making quick decisions to get my teammates open. So it’s been my teammates hitting shots basically. For the best front line combination in the NBA? It was in many respects one of the Bulls best games of the season, as Noah said, a fast start with a 21-11 lead working to Gibson inside and Noah with a driving slam dunk. Jimmy Butler added a late steal and fast break score and has more than made up for his shaky shooting. He does play shooting guard and hasn’t quite mastered the shooting part of the position. But he may have become the best rebounding guard in the NBA, in big part responsible for a huge 57-28 rebounding margin Tuesday and with 12 points and 13 rebounds. He’s averaging 11.7 points and 10.3 rebounds the last three games. He has been uncanny in his ability to get back for rebounds when Noah and Gibson are boxing out and away from the play. Noah had six points, six rebounds and six assists in the first quarter, exulting over his improved health in probably the longest stretch of good health in his career. The Bulls poured it on in the second quarter as D.J. 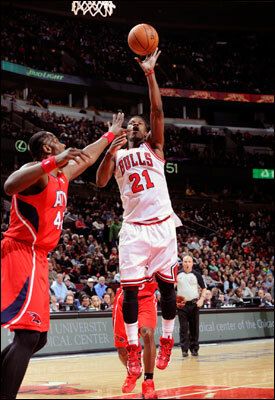 Augustin, who had 13 points and four three pointers, made a pair of threes and Kirk Hinrich added another. It enabled the Bulls to take that 25-point lead and 58-39 at halftime. Though former Bull Kyle Korver did extend his three-point shooting streak to 119 consecutive games. The Hawks came out stronger in the third quarter, trapping the Bulls on the pick and roll and causing problems for the smaller Augustin. 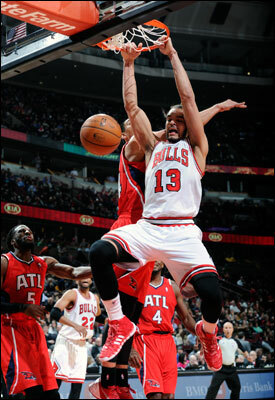 The Bulls offense stalled a bit as the Hawks got in position to make a late run. Though Noah did unveil some tricks for kids with a behind the back pass to Butler for a layup and 74-54 lead before that late third Hawks run. “Sometimes I feel we play a little too methodical and have to be more aggressive and picking our spots,” said Noah, who does his part to avoid that. Really, this man is a center? It was Noah with a quick jumper to open the fourth, Tony Snell with a nice spot up three and then Gibson again taking a pass from Noah for another solid looking jump shot. That gave the Bulls some space at 87-72. The Hawks scored seven straight. But then it was Gibson even with all those minutes making the big plays to shut off any further Atlanta threat. And then Noah closed out the scoring with a pair of free throws to get to 100 points and free Big Macs for the hungry home fans. While the Bulls may be getting to bite into the rest of the Eastern Conference with their sugar and spice and ham and eggs forwards. They go together very nicely.